Winter is here, in fact it has been for quite a while here in New York! With that comes many a humidity related problem for all of our beloved guitars. In cold weather, we use heat to keep us nice and toasty. Unfortunately with heat comes dry, dry air or low humidity. Guitars are generally built and are meant to be kept around 45% humidity. In the winters it is very common to have constant relative humidity in the 20% range. Ouch, for guitars (and our sinuses)! A lot of guitars come in the shop with the tell-tale signs of a dry guitar: sunken top in front of the bridge and out to the waists, a belly behind the bridge, loose bridge in some cases, a lot of relief in the neck, sharp fret ends, a dip at the fingerboard extension and maybe some top cracks or loose braces if the situation has gotten dire. These problems will always create terrible playability. 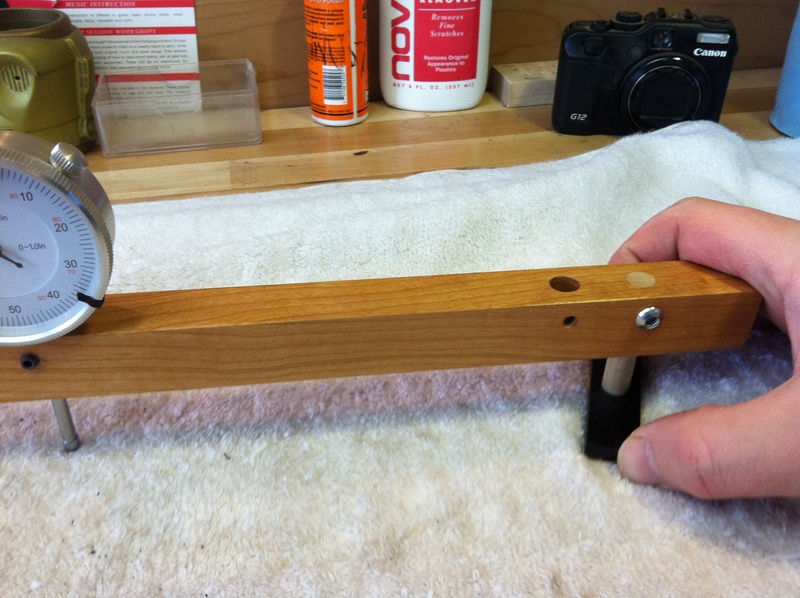 To repair these problems, under most circumstances, we can "rehumidify" the guitar. 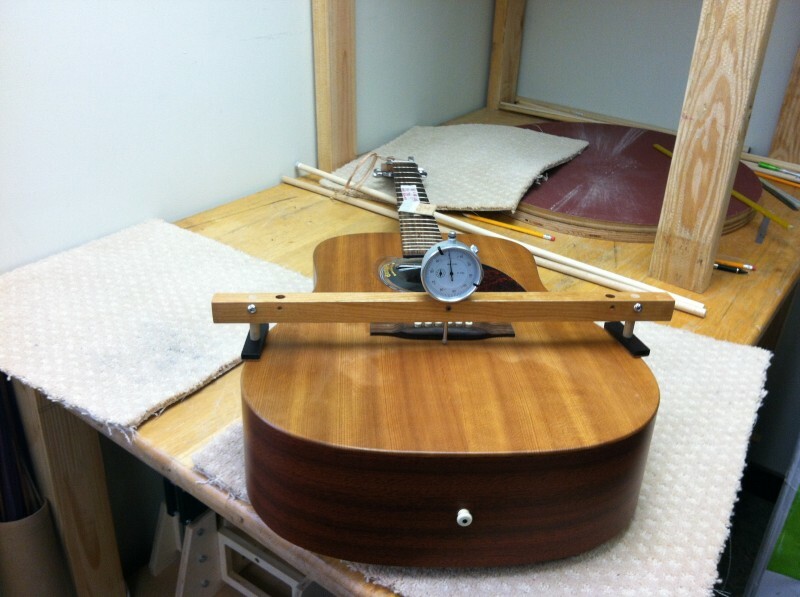 Usually I will allow the guitar to sit for a few days in my shop which is kept at 45% and monitor the guitar to see how much movement the top makes back towards normal. 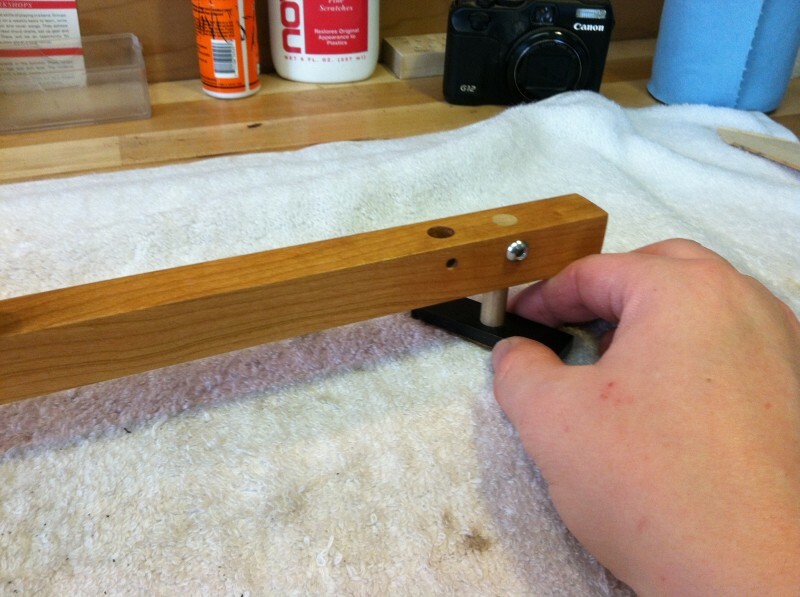 After that I may humidify further using Damp-its in the guitar to give it that last little bit of moisture it's missing. But how to tell if things are going back to normal? 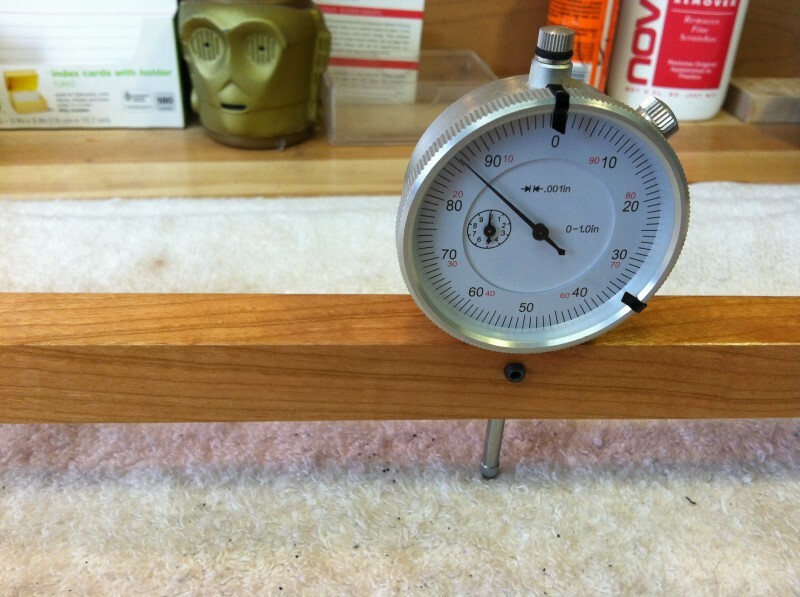 Well, that's what the gauge is for. It's based off of a gauge Frank Ford had made that I used often while working at Gryphon. 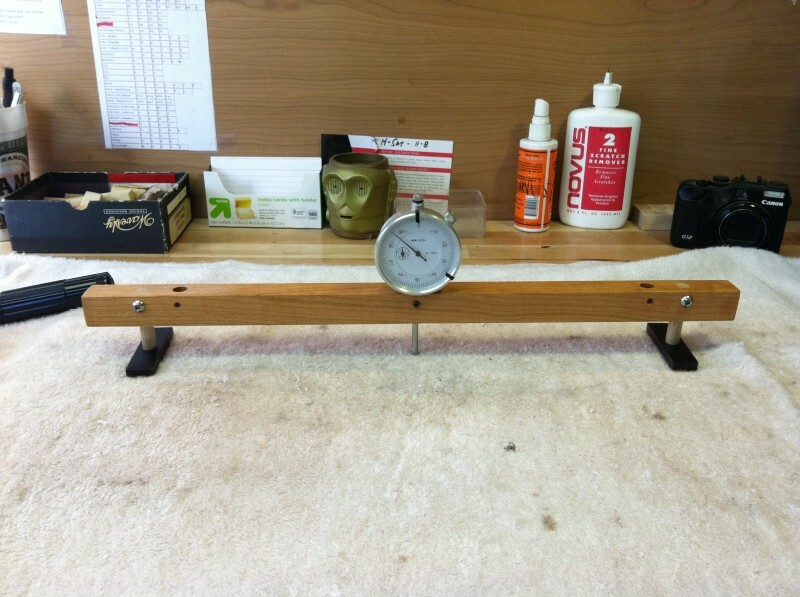 Also, Stewart MacDonald sells a nice gauge for a very reasonable price. In this case, I decided I'd make my own. The gauge is very straight-forward. 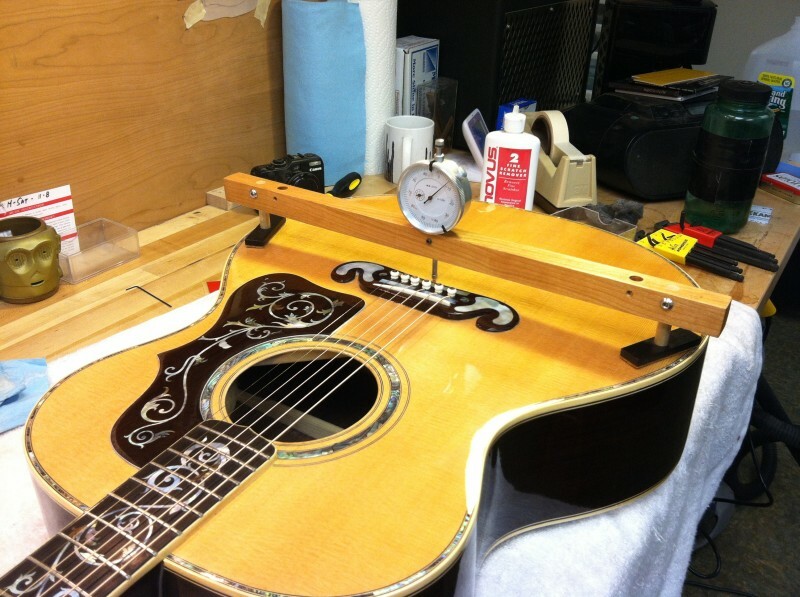 I place the gauge on top of the guitar, usually behind the bridge and set the indicator to 0. I check it throughout the day and can watch movement of 0.001", nothing the human eye can see. Most guitars come back usually in the first 5-10 days. After this rehumidification, I can then begin whatever repair may be needed, be-it repairing the frets, setting up the guitar now that the geometry is back to normal or anything else they may need. If you do not bring the guitar back to proper humidity, you are wasting time, energy and money for both the customer and the repairperson trying to fix the guitar while it is dried out.